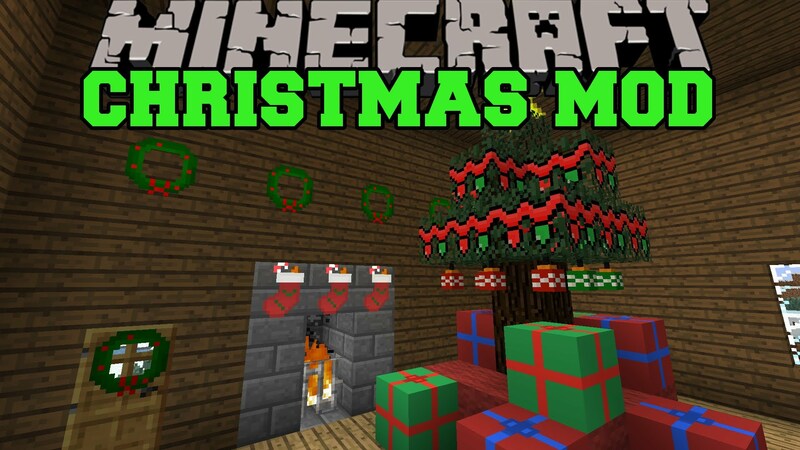 Joshua’s Christmas Mod 1.12.2/1.10.2 adds many Christmas-themed features to Minecraft. From decorations like Christmas trees, lights, wreaths, and stockings; to food items like sugar cookies, candy canes, eggnog, pies, and more. 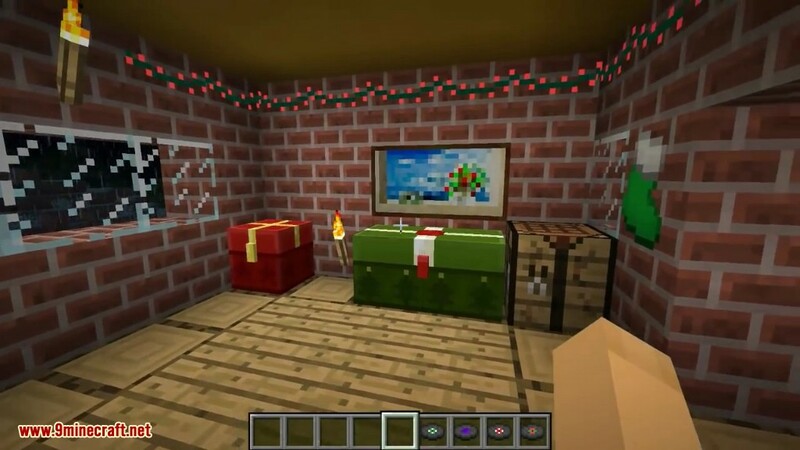 It is also fully survival friendly and multiplayer compatible, so grab your friends and celebrate this Christmas season. 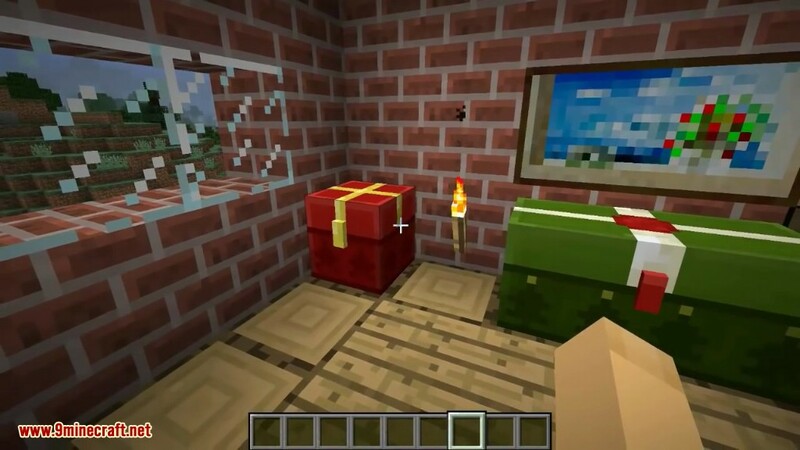 Shaped crafting recipe, requiring 1 Glowstone Dust, 1 Iron Ingot, and 3 Stained Glass Panes (white, red, yellow, lime, blue, or purple). Yields 4 Christmas Light Bulbs. Can be hung on most solid blocks, glass blocks & panes, iron bars, stairs, top half slabs, and fence. 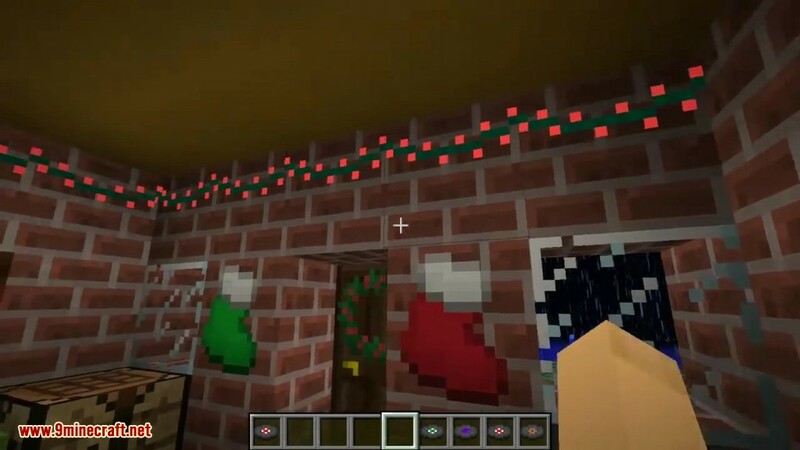 Shapeless crafting recipe, with all variants requiring 3 String and an assortment of Christmas Light Bulbs. Most recipes yield 3 Christmas Lights. Christmas lights and Christmas tree stars can be put a Christmas tree by right-clicking with them in hand. They can then be taken off by right-clicking the tree with an empty hand. Shaped crafting recipe, requiring 1 Stick and 2 Spruce Leaves. Shaped crafting recipe, requiring 5 Gold Ingots. Yields 2 Christmas Tree Stars. Shaped crafting recipe, requiring 1 Chest, 4 Paper, and 4 Red Dye. Yields 1 Red Present. Shaped crafting recipe, requiring 1 Chest, 4 Paper, and 4 Yellow Dye. Yields 1 Yellow Present. Shaped crafting recipe, requiring 1 Chest, 4 Paper, and 4 Green Dye. Yields 1 Green Present. Shaped crafting recipe, requiring 1 Chest, 4 Paper, and 4 Blue Dye. Yields 1 Blue Present. Shaped crafting recipe, requiring 1 Chest, 4 Paper, and 4 Purple Dye. Yields 1 Purple Present. Shaped crafting recipe, requiring 1 Chest, 4 Paper, and 4 White Dye. Yields 1 White Present. 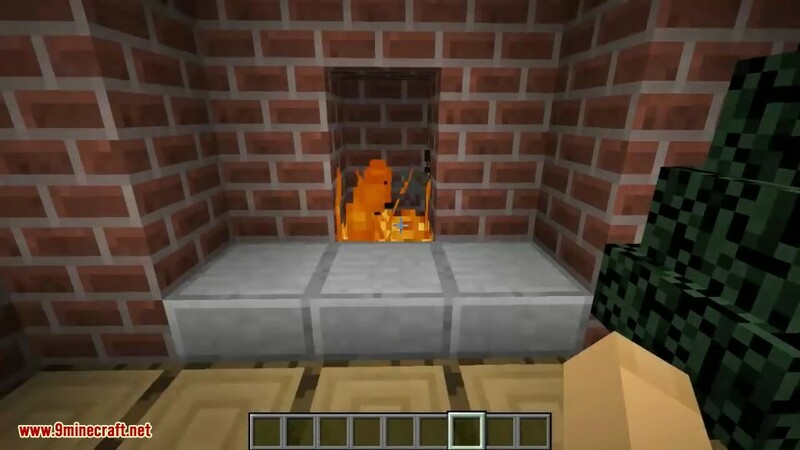 Can be placed on most solid blocks, top half slabs, and stairs. Can also be hung on any vanilla door by shift+right-clicking on the door. It can then be retrieved by breaking the door. 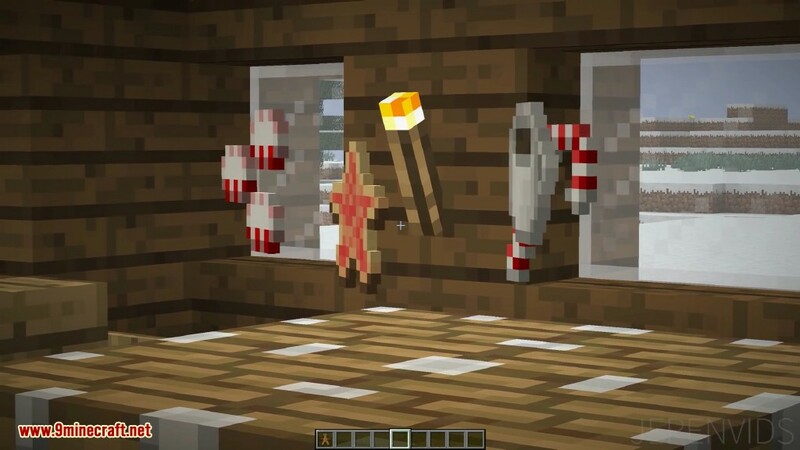 Shaped crafting recipe, requiring 4 Red Wool and 4 Spruce Leaves. 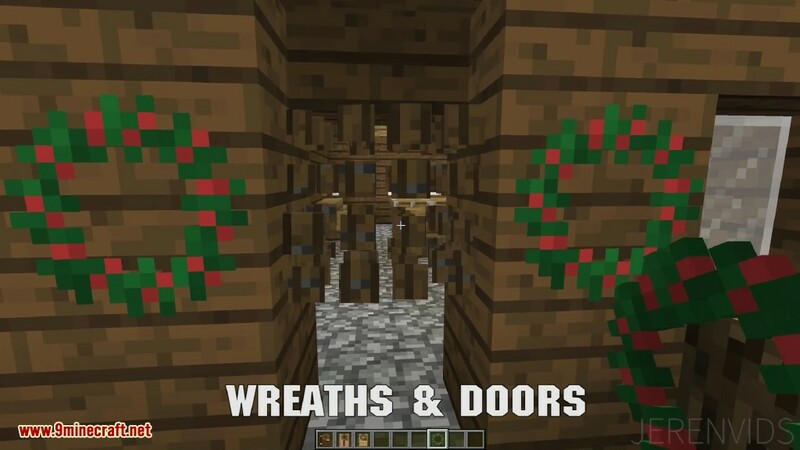 Yields 2 Wreaths. 2 shaped crafting recipes, requiring 2 White Wool and 5 Red Wool. Yields 4 Red Stockings. 2 shaped crafting recipes, requiring 2 White Wool and 5 Green Wool. Yields 4 Green Stockings. 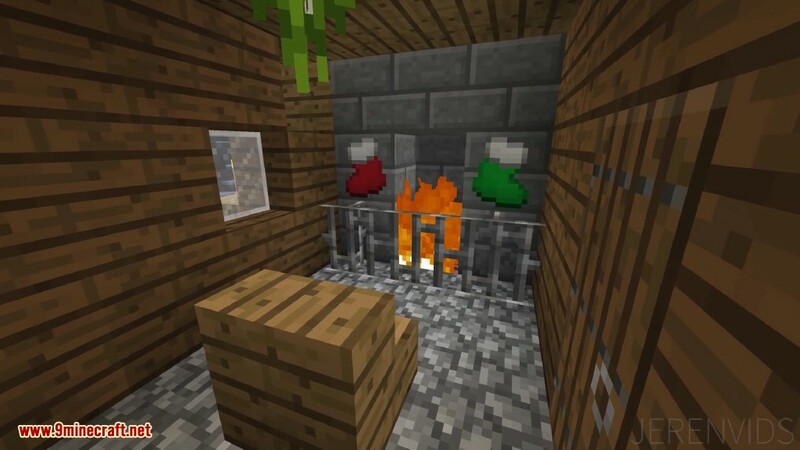 Stockings can be placed on most solid blocks, top half slabs, and stairs. Can be placed below most solid blocks, bottom half slabs, and upright stairs. Melts when exposed to bright light, like snow layers. Player must use silk-touch to reclaim, like glass panes. Shaped crafting recipe, requiring 5 Ice Blocks. Yields 8 Icicles. Acts mostly like a normal log, but burns forever like netherrack. Shaped crafting recipe, requiring 1 Spruce Log and 4 Netherrack. Yields 1 Yule Log. 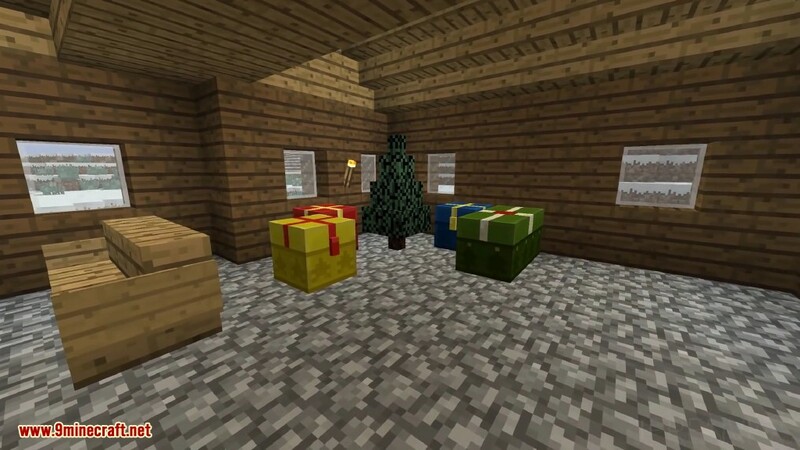 Wild mistletoe can be found growing on trees in most biomes, excluding hot biomes like savannas and humid biomes like jungles. When a mature wild mistletoe plant is harvested, it will yield 1 Wild Mistletoe item, as well as a random amount of Mistletoe Berries. If the plant isn’t fully grown, it will only drop 1 Mistletoe Berries. You can tell if the plant is fully grown by seeing whether or not it has berries. The plant grows naturally when exposed to enough light, and can be grown manually by using bone meal on it. Can be planted on the bottom of leaves or horizontal logs. Edible, but poisonous. 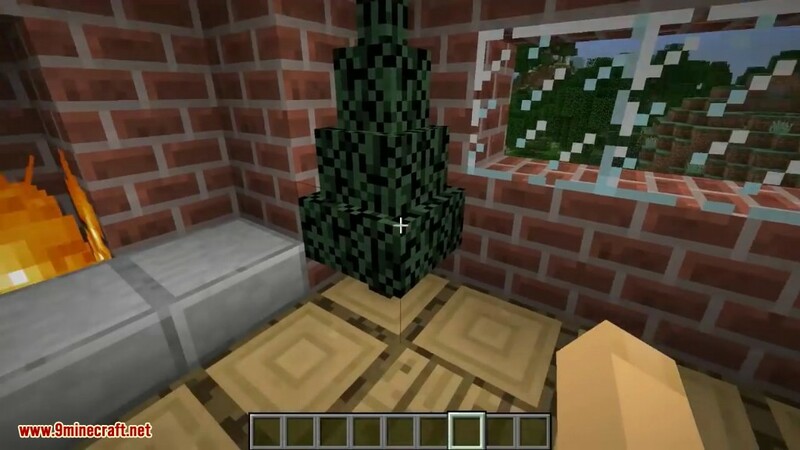 Only used as a crafting component for Decorative Mistletoe. Can be hung from the bottom of most solid blocks, bottom half slabs, and upright stairs. 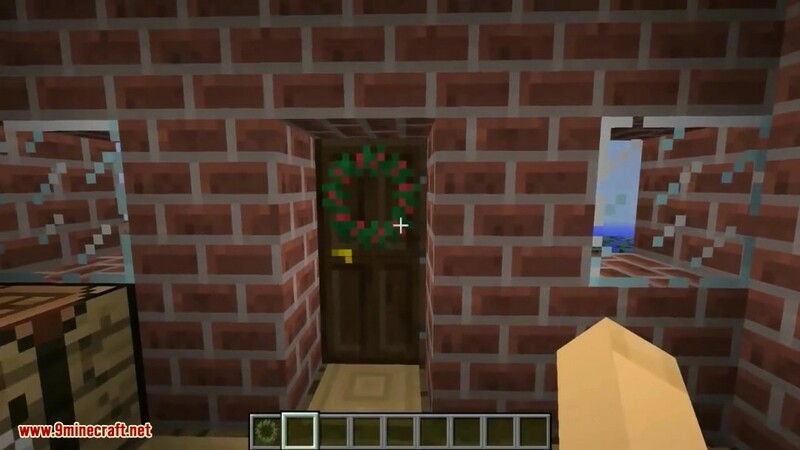 Shaped crafting recipe, requiring 1 Wild Mistletoe and 1 Red Wool. Yields 2 Decorative Mistletoe. Shaped crafting recipe, requiring 3 White Hardened Clay. Yields 4 Empty Mugs. Shapeless crafting recipe, requiring 1 Empty Mug, 1 Milk, 1 Sugar, and 1 Egg. Shapeless crafting recipe, requiring 1 Empty Mug, 1 Milk, 1 Sugar, and 1 Cocoa Beans. Eggnog and hot chocolate can be drunk even if the player isn’t hungry. Drinking them returns an empty mug. They also clear potion effects, just like milk. 3 shaped crafting recipes, requiring 3 Wheat, 2 Apples, and 1 Sugar. 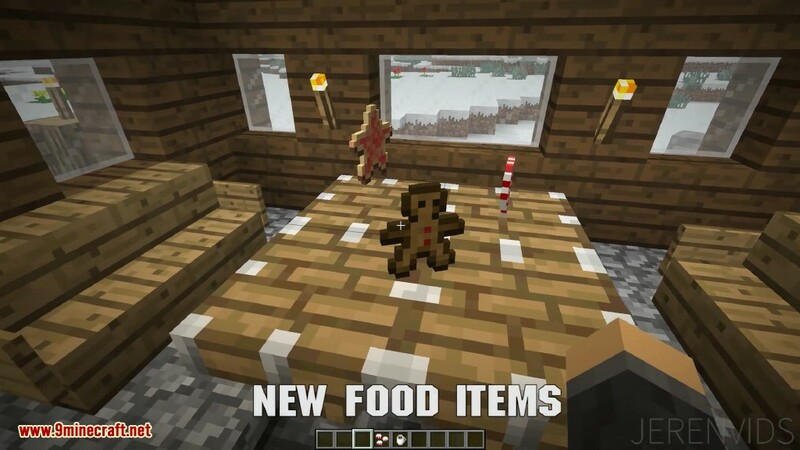 3 shaped crafting recipes, requiring 3 Wheat, 2 Carrots, and 1 Cooked Chicken. Shapeless crafting recipe, requiring 3 Sugar and 1 Red Dye (normally Rose Red). Shapeless crafting recipe, requiring 3 Sugar and 1 Green Dye (normally Cactus Green). Shapeless crafting recipe, requiring 3 Sugar and 1 Blue Dye (normally Lapis Lazuli). Shaped crafting recipe, requiring 2 Wheat and 1 Sugar. Yields 8 Sugar Cookies. Shaped crafting recipe, requiring 2 Wheat and 1 Red Sugar. Yields 8 Sugar Cookie Stars. Shaped crafting recipe, requiring 2 Wheat and 1 Green Sugar. Yields 8 Sugar Cookie Trees. Shaped crafting recipe, requiring 2 Wheat and 1 Blue Sugar. Yields 8 Sugar Cookie Bells. Used to plant a ginger crop and as a crafting component. Inedible in its raw form. Can be found in most loot chests. Shapeless crafting recipe, requiring 2 Wheat, 1 Sugar, and 1 Ginger. Yields 2 Gingerbread. Shaped crafting recipe, requiring 4 Gingerbread and 2 Red Sugar. Yields 4 Gingerbread Men. Used to plant a peppermint crop. Can be found in most loot chests. Harvested from a peppermint crop and used as a crafting component. Shapeless crafting recipe, requiring 1 Peppermint Leaf, 1 Sugar, and 1 Red Sugar. Yields 8 Peppermint Candies. 2 shaped crafting recipes, requiring 3 Peppermint Candies. Yields 2 Candy Canes. Shaped crafting recipe, requiring 4 White Wool and 3 Red Wool. Shaped crafting recipe, requiring 2 White Wool and 4 Green Wool. 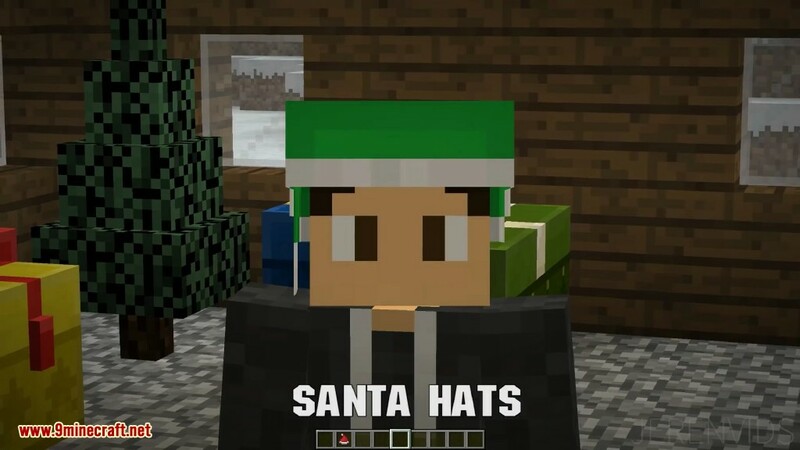 Both santa hats can be worn like a helmet. “Deck the Halls”, “Jingle Bells”, “Silent Night”, & “We Wish You a Merry Christmas” by Kevin MacLeod. They can be played in a jukebox. Found in dungeon and igloo loot chests. 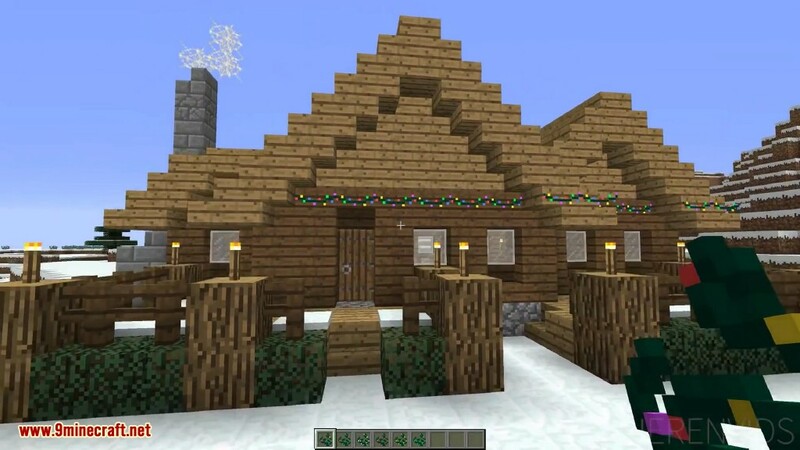 A “creative only” block for better looking snow coverage on roofs or stairways that use half slabs. Currently can only be one layer high. Melts when exposed to bright light, like standard snow layers. Drops 2 snowballs when harvested with a shovel.